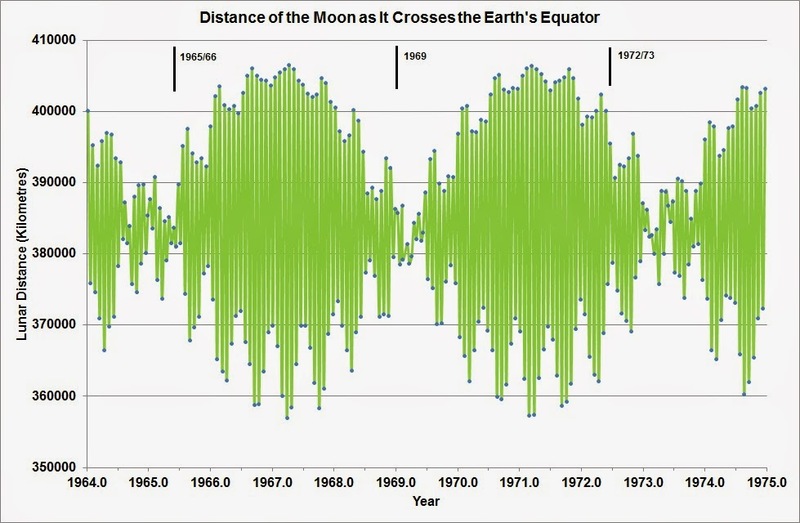 Figures 1, 2, and 3 (below) show the Moon's distance from the Earth (in kilometers) at the times where it crosses the Earth's equator, for the years 1964 through to 1995. Superimposed on each of these figures are the seven strong(#) El Niño events that occurred during this time period. 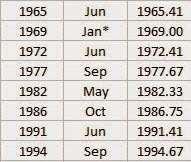 Table 1 summaries the dates (i.e year and month) for start of each of these seven strong El Niño events. 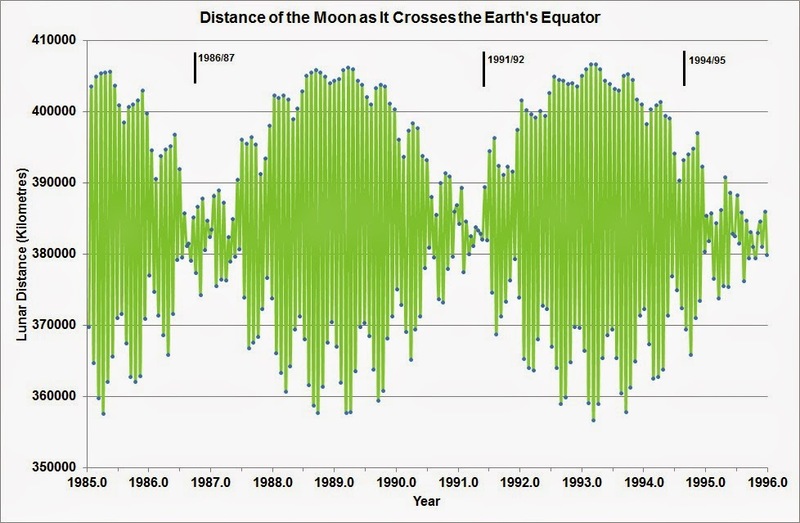 Figures 1,2 and 3 clearly show that all of the eight El Niño events in this tidal epoch occur at times where the distance of the Moon as sequential crossings of the Earth's equator have almost the same value of ~ 382,000 km. In the years when this happens, the lunar line-of-apse is closely aligned with either the December or June Solstice. a) during the other New Moon tidal epoch i.e. Epoch 3 - from the 8th April 1901 to 20th April 1932, El Niño events should also occur when the lunar line-of-apse is closely aligned with either the December or June Solstice. b) during the Full Moon tidal epochs i.e. Epoch 2 - 15th April 1870 to 18th April 1901; Epoch 4 - 20th April 1932 to 23rd April 1963; Epoch 6 - 25th April 1994 to 27th April 2025, El Nino events should occur when the lunar line-of-apse is closely aligned with either the March or September Equinox. 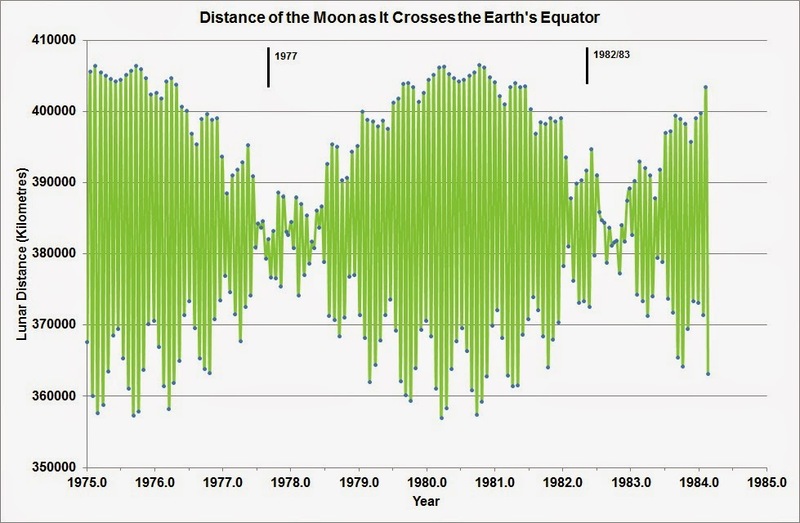 The switch between the timing of El Niño events, once every 31 years, at the same time that there is a switch from a New Moon tidal epoch to Full Moon tidal epoch, tell us that it is very likely that El Niño events, are in fact, triggered by the lunar tides. Lunar ephemeris data is used to find the times when the Perigee of the lunar orbit points directly toward or away from the Sun, at times when the Earth is located at one of its solstices or equinoxes, for the period from 1993 to 2528 A.D. The precision of these lunar alignments is expressed in the form of a lunar alignment index (ϕ). When a plot is made of ϕ, in a frame-of-reference that is fixed with respect to the Perihelion of the Earth’s orbit, distinct periodicities are seen at 28.75, 31.0, 88.5 (Gleissberg Cycle), 148.25, and 208.0 years (de Vries Cycle). The full significance of the 208.0-year repetition pattern in ϕ only becomes apparent when these periodicities are compared to those observed in the spectra for two proxy time series. The first is the amplitude spectrum of the maximum daytime temperatures (Tm) on the Southern Colorado Plateau for the period from 266 BC to 1997 AD. 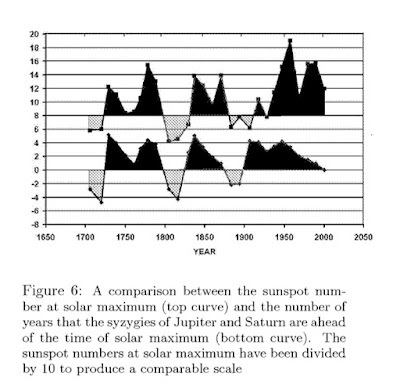 The second is the Fourier spectrum of the solar modulation potential (ϕm) over the last 9400 years. A comparison between these three spectra shows that of the nine most prominent periods seen in ϕ, eight have matching peaks in the spectrum of ϕm, and seven have matching peaks in the spectrum of Tm. This strongly supports the contention that all three of these phenomena are related to one another. A heuristic Luni-Solar climate model is developed in order to explain the connections between ϕ, Tm and ϕm. The influence of solar retrograde motion on secular minima of solar activity, volcanic eruptions, climate changes, and other terrestrial processes is investigated. Most collected data suggest that secular minima of solar activity, powerful volcanic eruptions, significant climate changes, and catastrophic earthquakes occur around events of solar retrograde motion.